Simbu's Osthi which was expected to release on Dec 8 will get delayed it seems. Sun pictures who bought the satellite rights of Simbu's Osthi is the reason for the problems caused. 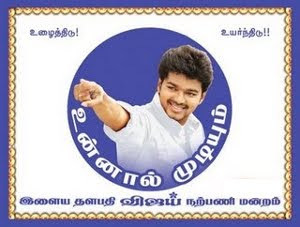 The Tamilnadu Theatre Owners Association has decided not to buy and distribute movies produced by Sun Pictures team. The reason for protesting against against Sun Pictures is that they are delaying in paying the deposit funds of 2.5crores for screening films produced by them. Till now Sun pictures didn't settle the money, So the Association is so upset with them.After knowing this issues, the Osthi team have handovered the satellite rights to Sun pictures. So the association has issued a red card on the film it seems. If things don't go smoothly, then Osthi will be put on for a long hold till problem solves. Chiranjeevi's son and one of the prominent Gen Y actors of Telugu film industry Ram Charan Teja got engaged yesterday, December 1, 2011. The engagement was held in the presence of family, close friends and relatives in Hyderabad. Chiranjeevi's bride is Upasana Kamineni, granddaughter of Prathap Reddy, the chairman of Apollo hospitals group. The engagement was held at the Temple Trees farm house near Himayath Sagar, Hyderabad. Attendees included his uncle Pavan Kalyan, Srikanth, Nagarjuna and Chandrababu Naidu. Veteran director Bharathiraja is up and running with his new film Annakodiyum Kodiveeranum after years of taking a sabbatical from films. For his latest film, he is using the RedOne camera, considered to be the latest in shooting films. Annakodiyum Kodiveeranum is being shot in and around Theni. The movie has director Ameer playing the lead with Karthika and Iniya cast alongside him. Interestingly enough, Karthika's mother Radha was launched (and also named) by Bharathiraja years back in Alaigal Oyvadhillai. Team 'Osthi' is running from pillar to post busy with work on the release of the film that fans are eagerly awaiting, but it looks like Simbu's fans are in for another treat as well. The star recently signed up as a brand ambassador for one of the leading beverages in the country, 7up! 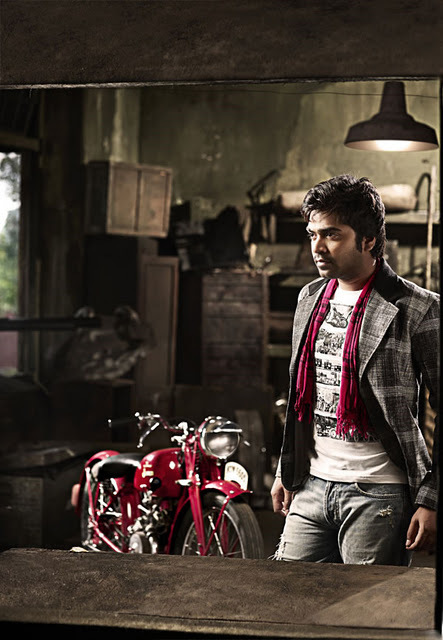 For this hush-hush shoot of the advertisement, Simbu flew to a set erected in Hyderabad and shot and flew back to Chennai immediately. Only select few top notch actors in the film industry get to be a face of these beverages and telecom advertisements and Simbu has now joined this bandwagon of stars who have been the face for soft drink ads, the list of Tamil actors which includes Vijay, Suriya, Madhavan and Asin. An official announcement will be made by the brand shortly along with Simbu's posters and the television commercial. 'Osthi' is seeing a big worldwide release on December 8, which also marks the 100th day of Ajith's 'Mankatha'. The Samudirakani-Sasikumar teamwork is back again with the former wielding the baton and the latter applying the greasepaint in Company Productions Poraali. This combination always stirs up expectations, thanks to their appreciated previous outings Subramaniapuram, Nadodigal and Easan. The arc of Poraali springs from Aristotle's words-Man is a social animal. And director Samudirakani goes on to say it is an uphill task to carry on in this world which is overcrowded with animals in the guise of humans. And hence people who manage to struggle and survive in such a scenario are indeed the 'Poraali's or Warriors. In Poraali, Samudirakani has dichotomized his film's setting as urban for first half and rural for the second half. The story completely rests on Sasikumar's shoulders whose fiery and powerful eyes do the major talking for him. With flowing mane on his shoulders and riding on twin horses, the director/actor/producer crafts a neat performance. Allari Naresh provides the appropriate foil and when Ganja Karuppu joins him, the humor quotient works well. Notable example is the scene when Swati's sister curses them both for the food that has been regularly supplied to them did not serve its purpose. Ganja Karuppu's antics belong to the harmless category with dialogues like 'Eppavo kedaikkara paal govaa vida ippa kedaikkara pepperminte thevalai' generating a smile. Nivedha, the new find makes you notice, Swati Reddy is apt but it is Vasundhara who scores well in a very small role. There are also Sasi-Kani's regulars like Jayaprakash, Namo Narayana and others. The perpetual drinker who helps Sasikumar in tricky situations is effective and Parotta Suri with a recurring statement annoys mostly. 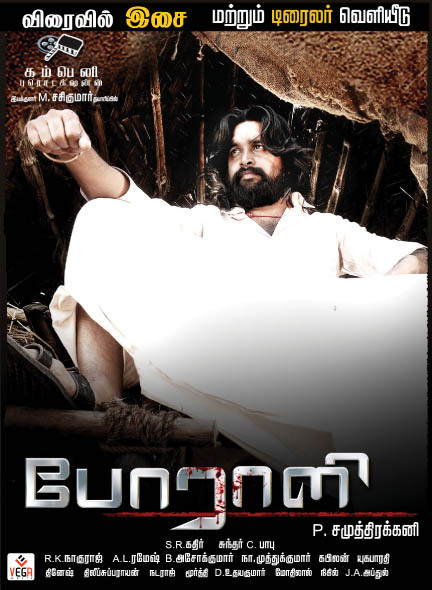 Poraali opens up majestically with Sasikumar riding on horses followed by a gripping chase and murder sequence. However this situation goes unexplained till the end leaving the audience clueless about its inclusion. The first half moves fairly at a uniform pace and there are minor twists that keep the narration going. The optimistic feel that is being conveyed is also something that is praiseworthy. Comedy works in tandem with the narration which lightens up the mood most of the time. Samudirakani has shown the diverse nature of human beings through individuals residing in different portions in a lower middle class house. However with the advent of second half and the flash back sequences, director struggles to keep his narration tight. This is majorly due to a very lengthy action sequences, some of them even gory and the maker loses his grip over his audience. To add to the woes, the sequences at the asylum are not for faint hearts and are quite disturbing. If these shots have been pruned, the effect could have been better. There are many characters in Sasikumar's household and it takes a while to get clarity on their relationships. Some scenes do give a docu feel and when Sasikumar continues to mouth preachy dialogues, a sense of tedium sets in. There may not be many people who could relate to such an issue in today's setting. Sundar C Babu's music is just about ordinary and so are the other technical departments of the film. It would have been an engaging flick had the director tightened his screen play in the second half. All the same, Kani and Sasi need to be appreciated for their earnest attempt. Verdict: This earnest Poraali needed more power.